The post-apocalyptic future has never been so close or real. It is July 2008, and the Newell family–consisting of jazz drummer father, feisty mother, and teens Miles and Sarah–leave suburban Minneapolis to escape to the safety and isolation of their summer cabin. Two years earlier, Mount Rainier exploded, causing global warming and the continual spread of ash. Crops are affected and food is beginning to run short; looting, rioting, and increased violence lead many to leave the cities. Miles cannibalizes the family’s boat and bikes, cleverly producing a pedal and wind-powered vehicle which gets them to their cabin now occupied by two other families who refuse to leave. A poignant subplot involving Miles’ oral history project provides the key to the family’s survival. “Riveting and all too believable.”—VOYA. And then there’s this. Could we ever have super-volcano effects like I describe in Memory Boy? Naw, forgeddaboutit, this writer says. Okay, I’ll try. Memory Boy was my break-out from the “Billy Baggs” series. I wanted to write something very different, very “high concept,” but still focused on family. In some ways, Memory Boy feels like my truest young adult novel in terms of its voice, tone and style. 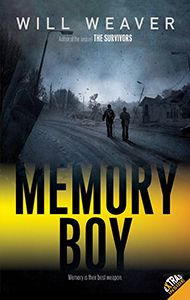 Memory Boy has also been my most popular YA novel to date. Below is a nice bump from a teacher–thanks!